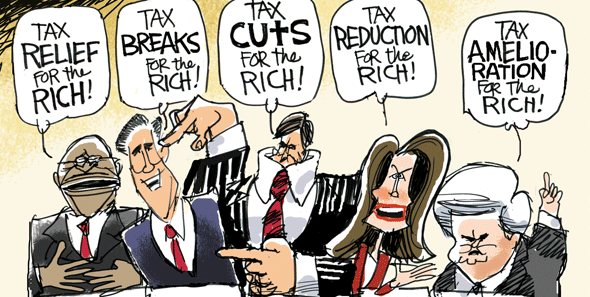 Why do rich pay less in taxes? There has been an ongoing discussion that the rich pay less in taxes, and that they don’t contribute to the economy the same way the rest of hardworking Americans do. What I wanted to know is how is it possible that the rich – you input your own definition of rich – still get away with it. As usual, the truth lies in the middle. It is quite likely that one of the wealthiest Americans, Warren Buffett, pays more in taxes but his effective tax rate is much smaller than that of many individuals earning $100,000 or less. The American tax system currently operates on a progressive tax rate. The more you earn, the higher the contribution. The rates start at 10% and go all the way to 39.9% but there are different investment methods and money allocation options that will affect that number. Assuming that regular citizens have no income left over for investments their tax rate is dependent entirely on tax brackets. Investors in America face much more preferred tax system helping them avoid high tax rates. Here’s an example. A married couple filing jointly whose joint income is $75,000 and has no dependents will be liable to the federal government for $7,298 or 9.7% of their income. (Assume standard deductions and 2 exemptions). The same couple contributing $10,000 to qualifying retirement plans can shield that amount from federal taxes and would be liable for $5,798 or 7.7% Being able to save and invest in one’s future makes a difference of $1,500 in saved tax liabilities. Wealthy individuals receive some or most of their income from investments. The investments such as dividends or stocks held for one year or longer have a tax bracket between 0 and 20%. A top rate for qualified dividends is 15%. So how would this type of income affect our couple mentioned before? If the couple’s income was derived entirely from dividends and not regular employment (keeping all other details intact) they would pay $0 in federal taxes, or 0% of their income. In fact, they could earn $100,000 in annual dividends, contribute $10,000 to deductible retirement accounts and still pay zero in taxes. This favorable investment tax rate is the major difference in how opinion on taxing rich is formed. Yes, affluent individuals’ effective tax rate is often much smaller than that of working class Americans. But they do contribute much more in overall dollar terms.